You may have experienced a situation like this: You are driving at night, perhaps in a desolate area, and realize that something is wrong with your car. The control of your car gradually gets more difficult and so you slowly ease the car over to the side of the road and get out. At this point you realize that you have a flat tire, and you do not have your spare. Maybe your vehicle has OnStar or you are a member of an auto club where you can find help just a call away. Yet if not, you may have to find a place to spend the night or flag down a passing driver for help. This is a situation that you could really benefit from having a well equipped road-side emergency kit in your trunk. Part of being a responsible driver is not only acing your driver ed test and following the traffic laws, but it’s being prepared for situations like this. 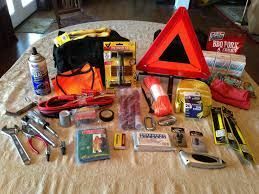 An emergency kit for the road in your car could make all the difference from being stuck somewhere for a while or getting back on the road safely and quickly. Every vehicle should have one. It’s not hard to put a kit together yourself and it may be less expensive than buying a ready-made one. Heavy-duty bag, backpack, or box to keep it all in. It’s a good idea to become familiar with your road-side kit before you ever have to use it. Be sure that all adult and teen drivers in your household know how to use each of the items that are in it. Using good judgment is the most important tool. Where you stop to change a tire is perhaps more important than just knowing how to change that tire, for example. So with a little planning, gathering, and space in your trunk; an emergency kit for your vehicle could really save the day. This entry was posted in Top Driver Blog and tagged Car Safety, Emergency Kit, Road - Side Emergency Kit, Road Safety.